Microbial Ecologist Jack Gilbert (BIO) recently discussed his research with the three-year Hospital Microbiome Project. This study aims to collect microbial samples from surfaces, air, staff, and patients from the University of Chicago’s new hospital pavilion in order to better understand the factors that influence bacterial population development in healthcare environments. He spoke about the project with WBEZ’s Afternoon Shift host Niala Boodhoo. More than half of infections that occur in hospitals are caused by the bacteria that live there, and that can make health care facilities a dangerous place for the people who need them most. The Hospital Microbiome Project seeks to change this by analyzing the different elements that cause infections in hospital settings. Jack A. Gilbert is the group leader for Microbial Ecology in the Biosciences Division. His ongoing research is focused on exploring how microbial communities assemble themselves in natural and man-made environments. 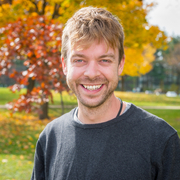 His interests include the use of metagenomics, metatranscriptomics, metaproteomics and metametabolomics to answer questions about microbial ecology, microbial physiology, and biogeochemistry. Gilbert also develops predictive models that help capture our understanding of ecosystem function mediated by microorganisms.